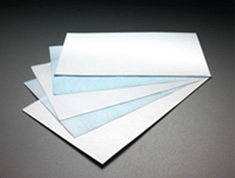 NitroBlot Nitrocellulose Membranes | Tamar Laboratory Supplies LTD.
Tamar’s NitroBlot membranes are manufactured using 100% pure nitrocellulose to ensure the highest binding capacity possible. Other membranes referred to as “nitrocellulose” may actually contain large amounts of cellulose acetate which will lower the protein binding capacity. Nitroblot membranes have the best handling strength of all pure nitrocellulose membranes. They are compatible with a variety of detection methods, including isotopic, chemiluminescent (peroxidase / luminol-based), colorimetric and fluorescent. The 0.20 µm pore size of the NitroBind nitrocellulose membrane ensures high binding capacity of small samples below 20 kD by reducing “blow-through”. The 0.45 µm pore size membrane is ideal for larger molecular weight samples. In addition to the high binding capacity, NitroBind nitrocellulose membranes inherently have very low background. The superior surface properties of the membrane guarantee superior signal-to-noise ratios, without the need for stringent washing conditions. A particular benefit of the proprietary NitroBond nitrocellulose formula is the proven excellent shelf life of proteins. Empirical evidence shows that proteins maintain molecular recognition activity for five years on NitroBond, which makes it the standard for protein blotting.